Teaching your dog any skill, even if it’s simply sitting on cue, is good for her brain. But teaching a dog to paint is a whole ‘notha level of mental enrichment. 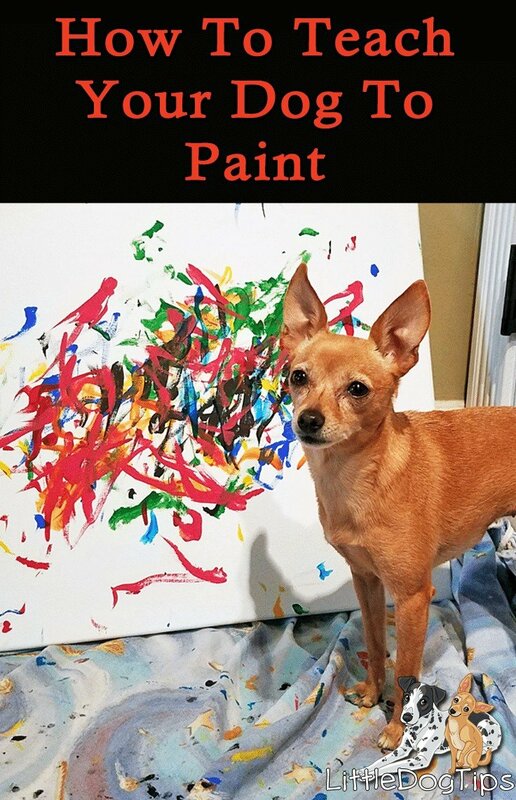 Though dogs mainly see colors as a limited range of yellows and blues, I truly think Matilda’s mind was blown when she first realized that she could make marks on a canvas. Dogs are terrible at generalizing. Matilda learned to paint with the canvas set up on the left side. When we tried practicing with it on the right, she totally forgot how to paint. We may try different set-ups in the future, but for now, keep things familiar! Prop up the painting against a wall or furniture. Make sure it’s stable. If the canvas falls over while your dog is painting, she’ll get spooked! Keep some paw wipes or tissues nearby. Your dog will get paint on her paws. Check the handle of her paintbrush before each stroke to make sure it’s clean. Getting paint on her paws or in her mouth might discourage your dog from painting, so do your best to prevent it. High value, bite sized treats like Natural Balance Mini Rewards – make sure to brush your dog’s teeth after chewy, sticky treats. You’re going to need to create a paintbrush with a T-shaped handle that your dog can hold comfortably. You’ll probably have to go through a few prototypes before you’ll create the perfect fit. 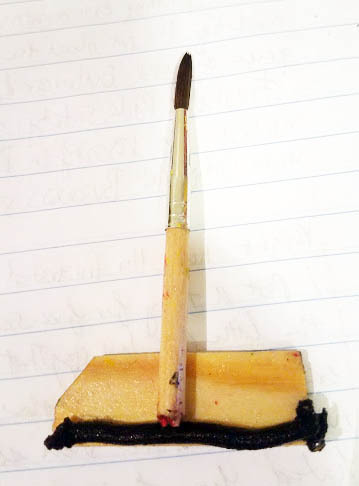 Matilda’s paintbrush consists of a broken piece of a wooden paintbrush superglued to a small, thin piece of wood, with a piece of a hairband glued to it for added comfort and grip. Prop up a canvas near your dog. She’ll probably investigate it – encourage and reward her for doing so! 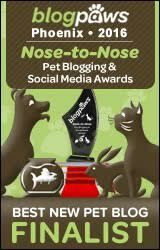 Your goal is to encourage your dog to approach the canvas nose-first. At this stage, your dog may be tempted to claw at it. Only reward nose-touches. You can “reset” your dog into a “sit” if she’s using her paws to touch the canvas. The hardest part about teaching your dog to paint will be getting her to hold onto the brush long enough to create art. 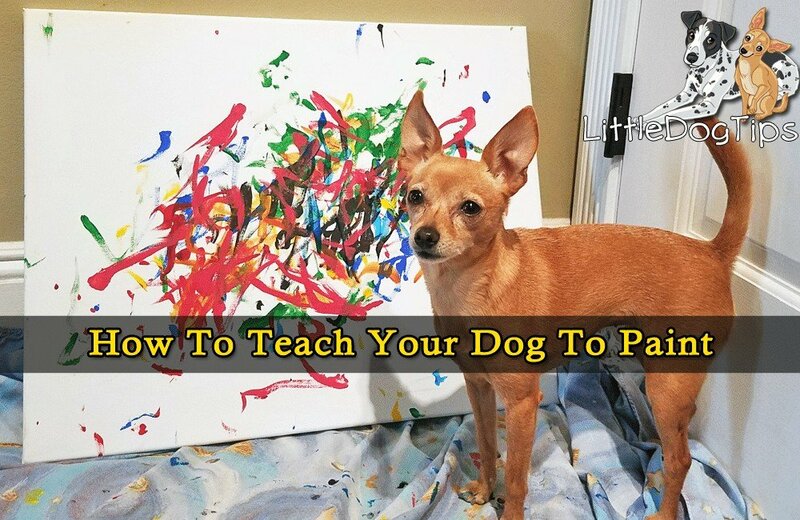 You’ll need to work on this for a few weeks before you can trust your dog with a loaded paintbrush. Here’s how I trained Matilda to hold objects in her mouth. To minimize messes, you’ll want to have your dog give you the paintbrush after each stroke. Your dog might already know how to “retrieve to hand” if you taught her to fetch by having her return objects to your hand, rather than dropping them at your feet. Practice this sequence of events in front of the canvas, with a clean paintbrush. Have your dog hold the paintbrush, then ask her to “paint.” She might drop the paintbrush as she touches the canvas. Do your best to do everything very close to the canvas so she does not have to carry the paintbrush in her mouth for too long. Make it as easy as possible! If you and your dog are not ready for this advanced trick, that’s okay! You can still make artwork together. Pig Placement Network uses this fun, easy technique to create pig paintings that they sell to raise money for their organization. I saw one of their pigs paint at a pet expo, and even purchased a painting for my art collector friend – then, I just had to go home and take it a step further with Matilda. Squeeze dots of paint all over your canvas. Wrap it in plastic wrap, then spread a yummy treat like peanut butter on top. Let your dog lick up the snack, so they’ll spread the paint layer underneath with their tongue. Then, unwrap and let dry! Here’s a video from Pig Placement Network of Pig Pig demonstrating this technique. Teaching your dog to paint is an advanced, multi-step trick. 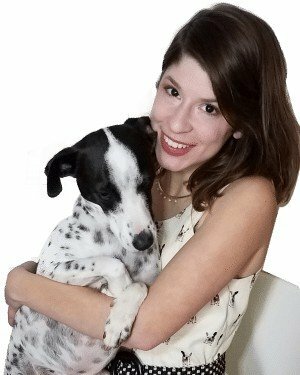 To reduce frustration, which will dampen your dog’s newfound love of art, make sure you’re setting her up for success. There’s no need to scold your dog for errors, just pick up the paintbrush and try again. After three “errors” in a row, take a break and change up your approach. For example, when Matilda kept pawing at the canvas instead of touching it with the brush, I went back to step one. Keep your reward threshold low at first. Reward your dog if she touches the canvas, but drops the brush instead of giving it to you. Those easy wins will make her tail wag and motivate her to keep training. Sessions should be short to accommodate your dog’s attention span and to avoid treat overload. Avoid practicing everyday – try alternating with different skills. Practice recall one day, painting the next, take a break on the third day and go for a hike, etc. The Happy Little Dog Challenge is a great way to refresh your connection to make training even easier and more fun. 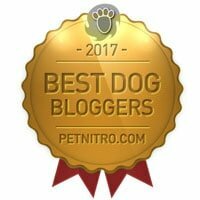 Share videos and photos of your dog’s work on our Facebook Page! We absolutely cannot wait to see more dogs and their guardians catching the painting bug. I tried to do these but my dog doesn’t seem to like the smell of the paint. Do you have some recommendations on what paint i should use? We use acrylic and tempera, but I think the least-smelly would probably be watercolor, which is also very easy to clean. Now i know that dogs can paint too. Thank you for the blog Thumbs up for this. This is very interesting, i think i should try these easy steps also to my dog! Hope it will work. I never thought that this is even possible. But, after reading this post I am sure they can also paint.